The Budget 2016-17 has proposed to provide a limited period ‘Tax Compliance Window‘ for domestic taxpayers to disclose undeclared income of previous years. This provision has now been incorporated in the latest Finance Bill 2016 and is referred to as The Income Declaration Scheme 2016 (TIDS-2016). 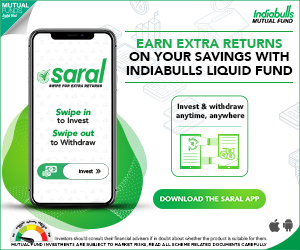 This scheme provides an opportunity to all persons who have not declared income correctly in earlier years (or) who have not paid full taxes in the past to come forward and declare such undisclosed income(s) or assets. The scheme shall remain in force for a period of 4 months. The declaration(s) can be submitted from 1st June, 2016. The last date to submit the declaration under TIDS-2016 scheme is 30th September, 2016. The scheme shall apply to undisclosed income whether in the form of investment in assets or otherwise, pertaining to Financial Year 2015-16 or previous years. However, foreign assets or income to which the Black Money Act 2015 applies are not eligible for declaration under this scheme. If one has failed to furnish Income Tax Return of previous years under section 139 of the Income-tax Act, such income can now be declared under this new scheme. (In case if you have received any notices under section 142(1) or 143(2) or 148 or 153A or 153C, your case may not be eligible for this scheme). If undisclosed income is in the form of an Asset, what will be the value of the such undisclosed Asset? – Where the declaration is in the form of investment in assets, the Fair Market Value of such asset as on 1st June 2016 shall be deemed to be the undisclosed income under the Scheme. Can the declarant claim any expenses or income tax deductions or allowances in respect of income declared under TIDS? – No deduction of expenditure or allowance shall be allowed. So, the total applicable income tax rate is 45% (30%+7.5%+7.5%) of the income declared under the scheme. What is the last date to pay the taxes? – The payments towards taxes, surcharge & penalty must be made latest by 30th November, 2016. If taxes are not paid before the due date, the declaration made under the scheme will become void. Where to submit the declaration form? Declarations can be filed online (exact procedure is yet to be announced) or with the jurisdictional Principal Commissioners or the Commissioner of Income-tax across the country. Is it possible to submit multiple Declarations? – No, only one declaration has to be filed. Is it possible to get any Refund of the Taxes paid? – No, any amount of tax and surcharge paid under this scheme shall not be refundable. Click on the below image to download ‘The Income Declaration Scheme 2016’, as provided in the Finance Bill 2016. 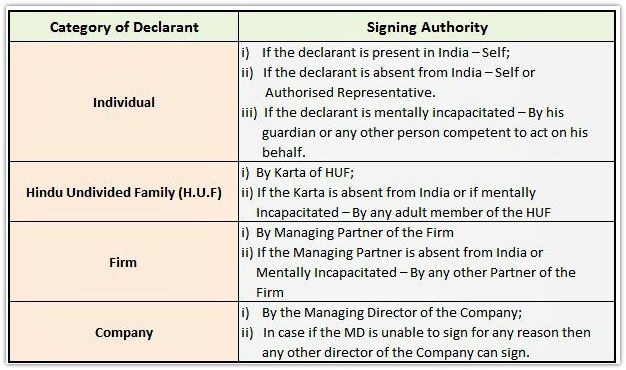 Will there be any scrutiny on these declaration(s)? – No Scrutiny and enquiry under the Income-tax Act or the Wealth tax Act shall be undertaken in respect of such declarations. Is Wealth Tax levied on the disclosed income? – Assets specified in the declaration shall be exempt from Wealth tax. Will there be any impact on the already filed ITRs? – Undisclosed income declared will not affect the completed tax assessments. Amount of income declared under this scheme will not be included in the Total Income of the declarant for any assessment year under the Income Tax Act. The Govt is also launching another scheme which is called as ‘direct tax dispute resolution scheme’ with effective from 1st June, 2016. Under this scheme, a declarant can file a declaration in relation to tax arrears (dues) or specified tax in respect of which appeal is pending before the CIT-A (Commissioner of Income-tax – Appeals). A similar ‘Voluntary Disclosure Scheme‘ was launched way back in 1997. This was successful to certain extent. So, we need to wait and see how far this new scheme will be successful in bringing people with domestic Black Money to books. (i) a minimum amount of 25% of the tax, surcharge and penalty to be paid by 30.11.2016; (ii) a further amount of 25% of the tax, surcharge and penalty to be paid by 31.3.2017 and (iii) the balance amount to be paid on or before 30.9.2017. For clarifications & FAQs on IDS 2016, kindly visit this link. Continue reading : How to declare Undisclosed Income (Black-money) under Pradhan Mantri Garib Kalyan Yojana 2016-2017? | New Income Declaration Scheme 2017. The gains are treated as Long term capital gains and taxes on LTCG are applicable. Kindly read: How to save taxes on Long term capital gains on Sale of property? If one declares additional income but not paid taxes by the end of the deadline, the individual/company will be treated as not having made any declaration at all. My Father is Senior Citizen and he made Bank F.D in 2009-10 on my Name or himself also out of his Income but he is not filled Income Tax Return for any Financial year so i want clarification whether this FD’r is covered under VDS Scheme or Not? If you have a taxable income which is above basic exemption limit, from this investment, you have to file income tax return. Kindly check for any ‘compliance notice’ from the IT dept, on e-filing portal. My father aged 70 years does’nt have any pension, he had some fd of rs 25 lakhs from which he gat 17000 per month, which is less then 3 lakh taxable slab for him, should he need to pay any tax on that? If the taxable income is below the basic exemption limit, no tax liability. But, advisable to file the Income tax return with zero tax liability. Read: Do I need to file Income tax return? Dear Nadeem ..You can consider this as a GIFT from your mother. Read: Gifts & tax implications. 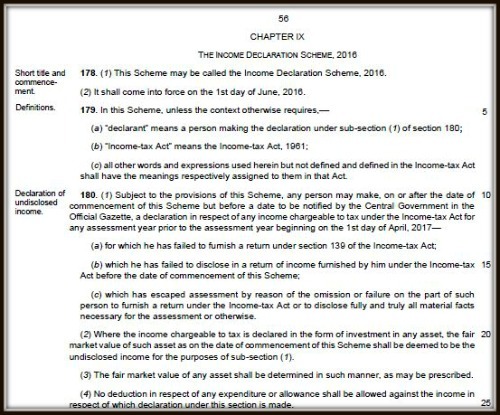 I want to declare my FD interest, of last year on which TDS has already deducted, under Income Declaration Scheme. So, Can I avail Such Tax Credit of TDS and if yes then How? Dear Priyanka..Instead you can file revised return (if your ITR is not yet processed). Dear Sir…….My ITR has already been procesed, it pertains to last year. Dear Priyanka ..You can include. But kindly note that the applicable tax rate is 45%. Suggest you to consult a CA. Can a 19 year boy who have never filed Income Tax Return disclose his income under the Income Disclosure Scheme? It’s mandatory for an adult individual who has attained an age of 18 years and whose income is above basic exemption limit to file Income Tax Return. So, I believe that he can disclose his income under IDS. Due to my carelessness, I forgot to file my income tax returns about 6 years ago. That year, I was earned approx 7 Lakhs, and my company deducted around Rs 1 Lakhs already through TDS. What is my best course of action? Should I use this income declaration scheme? Is the amount to be paid (45% of Rs 7 lakhs) MINUS (Rs 1 Lakh by TDS)? Dear Ashish ..Did you get any notice from the Tad dept? Suggest you to consult a CA and get this sorted out. I am confused on this, I bought a property for 50 lakhs and government valuation is 30 lakh, will i have to pay 30% tax on 30 lakh which is 9 lakh or the income generated from that property? I have already paid stamp duty charges when registering the property, could you clarify. Also i got email recently from incometaxindiaefiling.gov.in to disclose undisclosed income. Is this email sent to everyone who has given the email address or specific persons based on some criteria, please help!!! There is no need to pay any Tax as you have BOUGHT the property which is worth Rs 30 Lakh (registered value). If you get rental income on such property then you have to include that in your income tax return and pay taxes (if any) as per your tax slab rate. It is a general informative email. 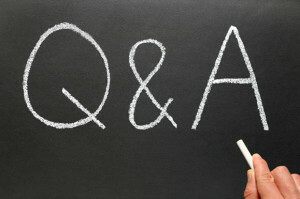 Thanks for the very useful replies that you give for our questions. Awaiting your quick response as the deadline for IDS submission is fast approaching and I too have received an email from incometaxindiaefiling.gov.in to disclose undisclosed income. I believe that email regarding IDS has been sent to almost all the Tax assessees. If you do not have any other income in India, other than the above mentioned ones then I believe that there is no need to file your income tax return (firstly), as the income is below the basic exemption limit. But, you have the option to file your returns for FY 2014-15 & FY 2016-16. Suggest you to consult a CA. Thanks a lot for your quick reply and it gives me relief. I will consult a CA per your advice. I purchased the property in July 2013 for Rs. 41.50 lakhs but the value in the registered sale deed is Rs. 20.70 lakhs only (the builder tricked me is what I realize now). I want to sell the property for Rs. 46.00 lakhs for which I am negotiating. However, due to the low registered value, the capital gains tax I will be paying will be quite high. Please suggest a way to get around the problem. Dear Chandra ..Is Rs 46 lakh going to be the registered value (for sale)? Yes, if the buyer insists on this. Otherwise, if the registered value can be pegged to around Rs. 30 lakhs, how can I receive and deposit the remaining amount of Rs. 16 lakhs which will not be showing up anywhere ? Dear Chandra .. You may have to accept it as Cash and it is treated as UNACCOUNTED MONEY. In case if you accept the entire money as WHITE money then you have to pay applicable taxes. Hope you will be able to advise me and help me pay the tax i am due to the IT department. Ever since i started self filing the Income tax (from AY 13-14) , i had not included the Interest from Savings bank account. (It was due to sheer ignorance, i came to know only today that TDS is not deducted by banks). However, i would now like to see if this something i can still pay now. And what is the process. Kindly note that interest up to Rs.10,000 earned from all savings bank accounts is exempt from tax – Section 80TTA. In case interest earned is more than Rs.10,000 in a financial year, the difference will attract tax. So, if your interest income from the savings accounts is Rs.7,000, you don’t have to pay any tax on it. But if it is Rs.19,000, you need to pay income tax on Rs.9,000 according to your tax slab. Note that deduction under section 80TTA is not available on interest earned on fixed deposits or term deposits . You may have to rectify your income tax returns and file again. Kindly take help of a CA. I think this scheme scores 70% (first class marks), if not state first or country first marks. More than 70% is a very good success. I also think that the consequences after 30-09-2016 shall be severe. People should come forward and utilise the scheme. Total put together 45% of tax is very reasonable in my humble opinion. You imagine a scrutiny for the year ended 2014 completes in Dec.2016 (2 years 9 months) with an addition of Rs.1,00,000/- the tax on this (max rate) works out to 30,000/-. The interest u/s.234B works out to around 10,000/-, total 40,000/- which is 40% on 1,00,000/- in just 2 years 9 months. What about the tax, education cess, interest u/s.234a,b,c and penalties etc., under several other sections. Thus 45% of tax including interest and penalties may be reasonable. Yes, as a matter of grace on the citizens using this scheme, the government shall fix the tax at 40%. Now it is over, the scheme has been announced. Dear RAMACHANDRAN ..Thank you for sharing your views. I want to know your advice regarding this . I am a laid of Software engineer for the last 2 years . I have 10 years of experience and all my income tax are perfect during my work years . Now somewhere from mid last year I started some consulting work which fetched me good amount being in dollars terms , even if the work was trivial . I think the amount will be 6-7 lakhs total for few months . I have not done anything regarding my income tax about this income . I totally lacked time .This was my sole income and can be classified as gross revenue . If I add all my expenses the my income will be trivial . This year I am continuing my consultancy work and will definitely do something about my tax before the end of year . Sir may I ask you what should I do about my income in previous year and also what to do for this year . Some added information : my clients are in foreign and i work from my house in my laptop . It is your responsible as a citizen of the country to file income tax return and pay taxes (if any). Suggest you to file your ITR at the earliest. Dear SAURABH..May I know what details you would like to have?? For FD the TDS is only 10%, but my tax slab is higher so I generally pay the extra tax for the interest during tax returns submission period (July). Mainly because the form enables me to find the extra total required to pay easily. Once after calculation I go ahead with self assessment payment thorough internet banking options. And then use that self assessment challan code and declare the IT returns. Is this the right approach ? Because the interest is credited the previous year? Will it be a problem ? But it also depends on the quantum of expected tax liability in a Financial Year. Sometimes, one needs to pay Advance tax. If in a financial year your total tax liability exceeds Rs 10,000 you will be required to pay Advance Tax. No, it is not the interest which is above Rs 10k, it is the tax liability. If the total expected tax liability is more than Rs 10,000 then one needs to pay advance tax. These type of nonsense schemes will not work. Nobody will come forward to declare their asset and pay 45% tax. Finance department of India is not only reluctant to people’s emotion, they are branded idiots. This goes straight to Mr.Jately and Mr.Modi. Before asking people to do this, can this be applied to ministers first? Let’s see if they can do it for the nation? Rich and Poor are saved, only middle-class people are tortured. Govt. must reduce the tax percentage to 10%, only then more than 50% Indians come forward to pay tax honestly. Otherwise, it just doesn’t work and let Govt. come up with new schemes and people (including govt. officers) know 100 ways to avoid it. I partially disagree with your view that nobody will come forward… Let’s wait for few months. I agree that most of the politicians are corrupt and have loads of black-money. I am sure they may never come out openly and disclose their un-accounted money details. Why do you believe that this kind of declared money goes to Mr FM & PM? 1) In the month of October 2015, Jaitley announced same scheme and it turned out be the flop show (check here more detailed report: http://bit.ly/1ONwtV9). So obviously nothing changes when they re-announce the same after 7 months. My whole point was, instead of “encouraging” they are trying to “threaten” and that’s why it doesn’t work. What they must understand is they are asking part of the hard-earned money, they must think about people’s emotion. Simple math or penalty just doesn’t work. 2)I meant the “branded idiots” compliment goes to Mr.Jately and Mr.Modi, not the money. pardon me if it was not conveyed properly in my previous comment. Agree with u , if first voluntary all minister , government official , including income tax officer (this are most corrupt people ) declare there income then common people will feel product to declare income and pay tax .